Each vial contains ceftriaxone sodium equivalent to <?xml:namespace prefix = st1 ns = "urn:schemas-microsoft-com:office:smarttags" />1g of ceftriaxone. Each gram of ceftriaxone contains approximately 82 mg (3.6mmol) of sodium. Powder for solution for injection (Powder for injection). 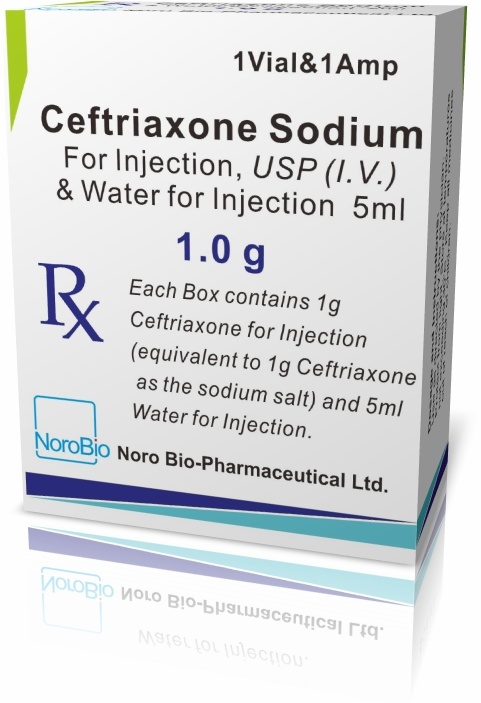 Ceftriaxone sodium is a broad-spectrum bactericidal cephalosporin antibiotic. Ceftriaxone is active in vitro against a wide range of Gram-positive and Gram-negative organisms, which include β-lactamase producing strains. Treatment may be started before the results of susceptibility tests are known. Ceftriaxone may be administered by deep intramuscular injection, or as a slow intravenous injection, after reconstitution of the solution according to the directions given below. The dosage and mode of administration should be determined by the severity of the infection, susceptibility of the causative organism and the patient's condition. Under most circumstances a once-daily dose or, in the specified indications, one dose will give satisfactory therapeutic results. Diluents containing calcium, (e.g. Ringer's solution or Hartmann's solution), should not be used to reconstitute ceftriaxone vials or to further dilute a reconstituted vial for IV administration because a precipitate can form. Precipitation of ceftriaxone-calcium can also occur when ceftriaxone is mixed with calcium-containing solutions in the same IV administration line. Therefore, ceftriaxone and calcium-containing solutions must not be mixed or administered simultaneously. Intramuscular injection: 1g ceftriaxone should be dissolved in 3.5ml of 1% Lidocaine Injection BP. The solution should be administered by deep intramuscular injection. Doses greater than 1g should be divided and injected at more than one site. Intravenous injection: 1g ceftriaxone should be dissolved in 10ml of Water for Injections PhEur. The injection should be administered over at least 2-4 minutes, directly into the vein or via the tubing of an intravenous infusion. Standard therapeutic dosage: 1g once daily. Severe infections: 2-4 g daily, normally as a once daily dose. The duration of therapy varies according to the course of the disease. As with antibiotic therapy in general, administration of ceftriaxone should be continued for a minimum of 48 to 72 hours after the patient has become afebrile or evidence of bacterial eradication has been obtained. Acute, uncomplicated gonorrhoea: One dose of 250mg intramuscularly should be administered. Simultaneous administration of probenecid is not indicated. Peri-operative prophylaxis: Usually one dose of 1g given by intramuscular or slow intravenous injection. In colorectal surgery, 2g should be given intramuscularly (in divided doses at different injection sites), by slow intravenous injection or by slow intravenous infusion, in conjunction with a suitable agent against anaerobic bacteria. Elderly: These dosages do not require modification in elderly patients provided that renal and hepatic function are satisfactory (see below). In the neonate, the intravenous dose should be given over 60 minutes to reduce the displacement of bilirubin from albumin, thereby reducing the potential risk of bilirubin encephalopathy. Standard therapeutic dosage: 20-50mg/kg body-weight once daily. Up to 80mg/kg body-weight daily may be given in severe infections, except in premature neonates where a daily dosage of 50mg/kg should not be exceeded. For children with body weights of 50kg or more, the usual dosage should be used. Doses of 50mg/kg or over should be given by slow intravenous infusion over at least 30 minutes. Doses greater than 80mg/kg body weight should be avoided because of the increased risk of biliary precipitates. Renal and hepatic impairment: In patients with impaired renal function, there is no need to reduce the dosage of ceftriaxone provided liver function is intact. Only in cases of pre-terminal renal failure (creatinine clearance <10ml per minute) should the daily dosage be limited to 2g or less. In patients with liver damage there is no need for the dosage to be reduced provided renal function is intact. In severe renal impairment accompanied by hepatic insufficiency, the plasma concentration of ceftriaxone should be determined at regular intervals and dosage adjusted. In patients undergoing dialysis, no additional supplementary dosage is required following the dialysis. Plasma concentrations should be monitored, however, to determine whether dosage adjustments are necessary, since the elimination rate in these patients may be reduced.